? Revive does not contain any medication.
? It lifts the skin slightly to increase blood circulation which reduces swelling.
? Alleviates pain by taking pressure off the nerve receptor under the skin.
? Allows full range of motion while providing muscular and joint support.
? Uncut Single Roll - One continuous roll measures 16.4 feet x 2 inches.
? Precut Single Roll - 20 strips, each measures 10 inches x 2 inches.
? Available in 9 colors: Black, Blue, Beige, Pink, Purple, Red, Green, Orange & Yellow.
? Uses the latest adhesive technology and guarantees to stay on for up to 7 days.
? Added Spandex improves flexibility while maintaining elasticity.
? Made with hypoallergenic medical grade materials that is water resistant yet gentle to the skin.
? Manufactured at highest standard. Use it with 100% peace of mind.
? You DO NOT need to baby-sit REVIVE. It will stay on. No fraying or loss of elasticity.
? Why harm your body with pain killers? Let Your Body Heal Itself.
? Proven by athletes & professionals. It is the Best Sports Tape on the market. HIGHEST QUALITY AND SUPERIOR ADHESIVE - Manufactured under ISO standard REVIVE Kinesiology Tape is FDA and CE approved. Made with medical standards, it is Hypoallergenic, Latex free, Water resistant and Breathable. It will stay on through intensive sweats, extreme moist weather, in the pool, and vigorous movements. FOR EVERYONE AND EVERYTHING - REVIVE Kinesiology tape is used by professional athletes, Physical therapists, and YOU. Designed for physically demanding sports such as football, basketball, swimming, or exercise such as weight lifting, yoga, golf and running. It is also therapeutic that helps you recover from injuries. EASY TO USE - Quick start instructions included that will let you enjoy REVIVE now. 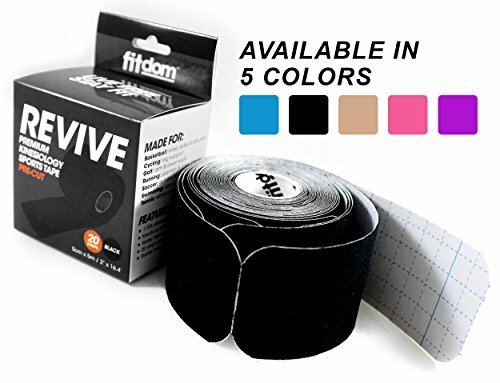 Contains 7 popular taping techniques and allows first time users to enjoy the benefits of Kinesiology Tape with ease. Easy-Grids backing lets you customize the tape application for joints and achieves maximum results. SUPPORT AND PERFORMANCE - REVIVE Kinesiology Tape facilitates muscle contraction, assists joint motion and stability. Unlike the traditional sports tape, REVIVE provides support and recovery without limiting motion. It enables you to be you with minimum restriction. 100% MONEY BACK GUARANTEE AND HASSLE FREE RETURN - If you are not Satisfied with Fitdom REVIVE Kinesiology Tape, just return it for a full refund, no question asked.